If somehow you hadn't noticed there has been an absolute explosion over the last 5 years of excellent professional quality vocal gear designed to give the modern vocalist absolute control over his or her sound. With the likes of EV, DigiTech, and Electro-Harmonix in the game the list is long and noteworthy. All focus on multiple product lines supporting a broad variety of instruments. Non-focus specifically on the vocalist which is a crown that solely belongs to TC Helicon. Arguably they wear it pretty well. The same outfit headquartered in British Columbia, Canada that brought us the VoiceLive, VoiceTone, and VoiceWorks have now introduced 2 new fully in-house designed professional live microphones: The TC-Helicon MP-70, featuring a dynamic super-cardioid capsule with neodymium magnet and MP-75 building on the MP-70 with the addition of a mic control circuit. This switch is designed to interface with existing TCH vocal processors allowing you to control effects directly via a recessed micro switch located on the MP-75. When design started for the MP series microphones TC Helicon had never to date built a microphone. So what did they do? Borrow a capsule from another manufacturer and build around that? Nope. TC instead designed a brand new microphone from the ground up utilizing what are in typical TC fashion very high-grade components and top rate construction. TC has designed what they call a "modern performance vocal microphone"; A vocal mic specifically designed for the way we as modern vocalists sing using amplification. Vocals in modern music are much more than a mic and a PA and as an artist you deserve to have the best performance every time. Call it controlling your own destiny. Taking that control a bit further is the MP-75. As luck would have it TC Helicon was gracious enough to bestow upon us a fresh one to run through the paces . Retailing on the street for $169 the MP-75 features what TC calls a Lismer capsule which is a proprietary design consisting of a patented Neodymium magnet structure suspended by a dual shock mount for low handling noise. Helicon is mum about construction detail specifics so all we know is the diaphragm itself consists of some type of dual material construction. Upon opening the TCH container we find the MP-75 stored inside a padded cylindrical mic case emb lazed with TC Helicon logos. This is a tasty detail touch that is a step up from the mic "baggies" everyone else provides. While I wouldn't necessarily recommend dropping it off a building the design is nevertheless fairly beefy. The case top unzips to reveal the MP-75. The MP-75 itself is actually a rather handsome mic. 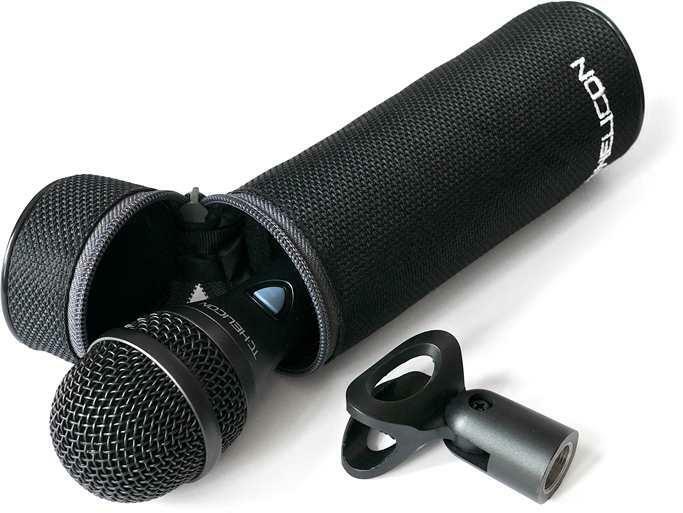 Coated in a subtle sparkle gray finish with relatively large ovoid pop screen the mic has rather nice ergonomics with a comfortably sized handle and pronounced kneck taper that fits well in the hand without fatigue. At the base of where the taper starts up towards the mic head lies the triangular shaped purple-hued control circuit button. Unscrewing the pop screen reveals the beauty extends inward as well with what appears to be a fairly large diameter capsule similar in size to the huge EV N/D767A. The shock mount is equally as nice with plenty of give for aggressive singers and low handling noise. In a rehearsal environment with full band, the TC MP-75 was plugged into my signal chain consisting of a VoiceLive1, VoiceTone T1 and VoiceTone D1. I initially set it up to control only my VoiceTone D1 doubler pedal and made sure the mic control button on the T1 adaptive dynamics pedal was disengaged as I like to leave it engaged 100% of the time. I was initially struck as to how big and rich the MP-75 sounds. With the mixer EQ fully zeroed out I felt no need to make any adjustments as it sounded great as is with my voice being more of the Leggerio/Lyric tenor and subsequently carrying a bit less weight than that of baritone/bass singers. Some vocalists may find they need to dial back the low end slightly to avoid a bit of muddiness. I found the Helicon to demonstrate and excellent amount of cut that allowed me to easily be heard over the band without being anywhere near the point of feeding back. This is where the MP-75 absolutely crushes any other live performance microphone I have used to date. Nothing I could do from cranking the PA to cupping the mic to pointing it directly at my monitors could get it to feedback. Quite honestly the MP-75 has some of the best feedback rejection properties I have ever seen in a live mic. That finally brings us to the other little detail setting the MP-75 apart from the pack - it's simple control switch. S o simple in fact that all you can do is switch an effect on or off. For some reason, however, that is absolutely awesome. No longer do I have to be near my pedal board when a song change is coming ready to switch. Suddenly it's also easier to switch multiple effects at once. For example now instead of using two feet to simultaneously change a setting on my VL1 and D1 I can engaged the D1 directly from the mic. It's simple yet oh so practical. So window dressing aside: has TC managed to create something that sets itself apart from the 99,000 other excellent alternatives out there? I think so. 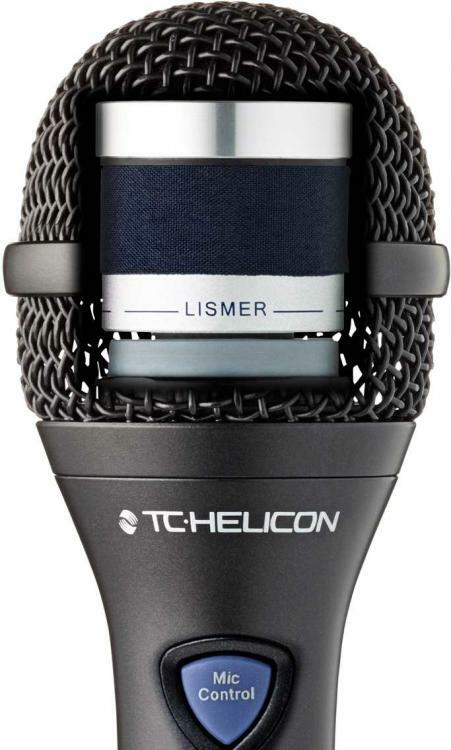 Combined with its excellent dynamics, nice cut and superior feedback rejection properties along with it currently being the only mic out there with onboard effects control TC has in my opinion effectively managed to encapsulate a true modern vocalists microphone. It's a pretty safe bet the MP-75 is going to be my new go-to mic for the foreseeable future. So tell us TC when can we expect a wireless version? *This product review is a courtesy of The Modern Vocalist World and is endorsed by The Vocalist Studio International.